Today, our great country is no longer known for producing automobiles, computers, etc. Do you have any idea what our country is known for producing today? This product is advertised on television every 30 seconds, several hundred times a day. More than 250 million Americans consume this product every day. Americans buy this product even if they don't have the money. -- they rely on insurance to get this product for free or at discount They even encourage their children to buy this product -- they encourage implicitly, not explicitly. Have you figured out what this popular product is? It's drugs! -- prescription drugs, as well as OTC drugs. Ironically, there is a "war on drugs" against cocaine, heroin, crack, and other street drugs. But, the top-selling drugs in America are the prescription and OTC drugs! Prescription drugs generate bigger profits and revenue than any other singular product in the United States of America. This product is consumed by more than 4 out of every 5 Americans every day! The nine largest drug companies raked in $50.6 billion in 2001 profits. During the past decade, drug firms’ profits represented an 18.5 percent return on revenue or 5.6 times the median return (3.3 percent) of Fortune 500 companies. As the economy soured further in 2002-2003, many drug companies continued to grow and thrive with record profits. And, despite the severe recession in 2008, the profits of these drug companies continued to grow, and has skyrocketed to over $100 billion! According to IMS Health, pharmaceutical companies will bring in $880 billion in global sales in 2011, representing a growth rate of 5-7%. IMS Health studies show that the U.S. remains the largest market in the world for pharmaceuticals with total sales of $330 billion in 2011. And, the number of people with heart disease, cancer, diabetes, and arthritis, obesity, and other diseases also skyrocketed, growing more than 47%! A 47% increase in disease and a 300% increase in drug profits. Does that make any sense? It does -- if your goal is to make money at the expense of the sick. So, do you think that your friendly doctor and the drug companies are trying to help you improve your health by convincing you to take more and more drugs? And, are you aware that you (as a diabetic patient) generate an average of almost $190,000 of revenue during your lifetime for the doctors, hospitals, insurance companies, and pharmaceutical companies? That's right! You're seen as a "cash cow" by the medical doctors, hospitals, the pharmaceutical companies and the insurance companies. And, if you happen to have a good job with a good salary, it's closer to $250,000 -- a quarter of a million dollars!! Can you say ka-ching? Medical debt is the Number 1 cause of bankruptcy in the good ol' USA. Medical debt is also the Number 1 cause of homelessness in the US. And, we accept this as the norm! "You have a great story, but you're wasting your time. People won't listen to you. People prefer to take our drugs instead of change the way they eat. It's easier to pop up pill than change your diet." Mr. McCulley disagreed with them, but they said: "Okay, you're an engineer, right? Just take a look at the numbers: There are millions of diabetics who take our drugs, and we make billions of dollars off those drugs, and our revenues are going up every year." Another pharmaceutical rep said: "And, it's not just the diabetes drugs. We make a lot of money off the pain medications, the cholesterol drugs, and high blood pressure drugs -- just to name a few." The first pharmaceutical rep said: "People are hypocrites." They tell you they love your story, but they don't buy your book. Instead, they buy our drugs." Another pharmaceutical rep joined in on the conversation, and said: "I heard you mention that you're trying to get on TV, radio, and Facebook. You're wasting your time. We control a lot of the TV ads. TV isn't going to risk losing big revenue from us to air your story. Radio is passé -- who listens to the radio? And, forget about Facebook! People don't want to hear about diabetes and dieting on Facebook. 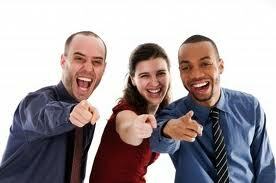 People like to gossip -- that's why Facebook is so popular." The second rep: "Yeah, you should give up while you still have your dignity." Mr. McCulley was steaming on the inside, but he smiled and said: "You underestimate the will of the people. They're tired of being lied to, they're tired of being sick and relying on your drugs. They're going to rise up against you and reject your drugs. It's already starting to happen. People are smarter and more resourceful than you think. You'll see ..."
But, there is something that you can do! Let's take that smirky smile off their faces. Please help us (and you help the world!) in the fight against diabetes and the drug companies by becoming a Fan of Death to Diabetes and by joining us on Facebook. And, if you want to help even more, go the bottom of this web page for a list of things that you can do that will take less than 2 minutes to accomplish. Let's show them that we're not ready to lie down and let them walk all over us. Remember: If you don't do your own research and educate yourself about diabetes, these myths about diabetes will prevent you from having the opportunity and the belief that you can reverse your diabetes! And, the experts who are not telling you the truth will have you locked into remaining diabetic and suffering unnecessarily from this disease. The American Diabetes Association is Searching for a Cure. Sure, they are. They are simply taking your money and promoting the drug and food companies agenda. That’s in my opinion and in those of many other diabetics. By the way, I worked (as a volunteer) for the ADA for more than 3 years. Diabetes makes you fat. Being overweight may be caused by poor diet and lack of exercise. It is a fact that the majority of diabetics are overweight. The diabetes is a symptom with the same causes as the weight gain. Cinnamon lowers blood sugars. While cinnamon can enhance the tastes of foods, it has not been proven to lower blood sugar readings over the long term. There was a study that showed an reduction in blood sugar but it did not last. Subsequent studies have not shown any benefit from cinnamon. Gorging on cinnamon can cause liver inflammation so use in moderation. Diabetics should be on a low fat diet. Not true. Diabetics need the good fats in their diets just like everyone else. These low fat diets were the knee jerk reactions to problems caused by the bad fats in our diets. 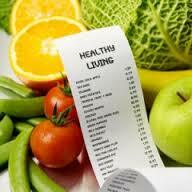 Diabetics should concentrate on avoiding junk foods and eat diets containing foods that stabilize blood sugars. Insulin cures Diabetes. Nope. It helps control sugar levels by ushering glucose into the cells. The underlying causes are unchanged. Taking insulin forming pills or insulin is simply buying time to seek a cure. Diabetes is incurable. - At least that is what we’ve all been told. Is diabetes curable? Somehow these experts haven’t talked to all the people who are living medication and insulin free. You won’t see their stories in the popular diabetes magazines either. That doesn’t sell advertising to drug companies. There are many former diabetics who lead drug free lives because they changed their former self destructive eating habits and added regular exercise. Today, there are many doctors like Dr. Rosedale, Dr. Mercola, Dr. Young, Dr. Fuhrman, Dr. Barnard, and Dr. Oz who are challenging this myth and proving it to be untrue. There is no pill you can take to cure diabetes or any other disease. 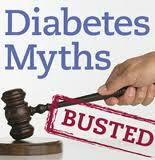 There are many diabetes myths circulating among diabetics, today. Some of these were started through ignorance, others by doctors, dietitians and diabetes educators, others by a single flawed study, and still more exist because of a resistance to change by diabetics. In some cases the very people that claim to be helping diabetics are actually lying to them. Key Point: If you don't do your own research and educate yourself about diabetes, these myths about diabetes will prevent you from having the opportunity and the belief that you can reverse your diabetes! And, the experts who are not telling you the truth will have you locked into remaining diabetic and suffering unnecessarily from this disease. Here are several myths and misunderstandings about diabetes, drugs, nutrition and other related topics. Truth: Diabetes should be taken as seriously regardless of whether you are taking pills or injections. Unfortunately, because we live in a drug-tolerant society that sees pills as “normal”, we don’t really believe our health is in any danger if we are taking pills. Either way, the diabetes will still progress and lead to other health complications. 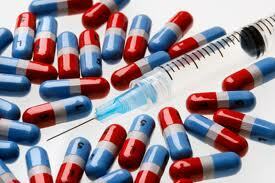 In fact, pills lull diabetics into a comfort zone and a false sense of wellness that eventually fails them. Truth: You may be able to temporarily lower your blood glucose level, but you can’t avoid a major macronutrient such as carbohydrates and expect to get healthy. Besides, not all carbohydrates are bad – it’s the refined carbohydrates such as white bread, pasta, and cereals that are the problem. However, good carbohydrates, such as broccoli and Brussel sprouts, actually provide some of the missing saccharides, which help to repair the cells and reduce the insulin resistance. However, if you avoid eating a lot of animal meat,, your grocery bill go down drastically. And, as your health improves, you will save money with over-the-counter drugs, prescription drugs, doctor visits, physical exams, hospital stays, and the quantity of groceries.